Sloty is licensed by the UK Gambling Commission and the Malta Gaming Authority. It has 24/7 customer support via live chat and a freephone telephone number for international and UK callers which puts customers at ease with any problems or issues that they may have. Sloty has a real relaxing, air of serenity feel about it. Landing on the homepage you are engulfed in a sea of blue – the colour of tranquillity and calmness – and that’s exactly the feeling that washes over you on arrival. The transitions between the pages further enforce that feeling too as you flick seamlessly between each page in a smooth and effortless manner. The navigation is excellent too. The full-width look of the website makes it easy to get around, and on the games page, you are met with alluring imagery and a number of categories so you can easily find the game you’re looking for in no time at all. Sloty offer one of the biggest welcome bonuses that you’ll find on any online casino anywhere. 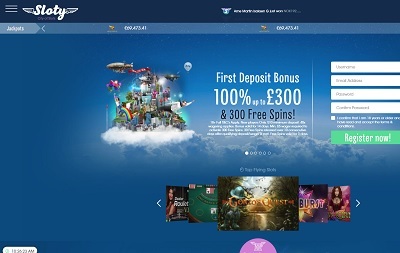 With your first four deposits, you’ll be eligible for £1500 plus 300 free spins, and this is how it works: on your first deposit you’ll receive a 100% match up to £300 plus 300 free spins, on your second you’ll get a 50% match up to £400, on your third you’ll get a 25% match up to £400, and on your fourth you’ll also get a 25% match up to £400. And it doesn’t stop there. 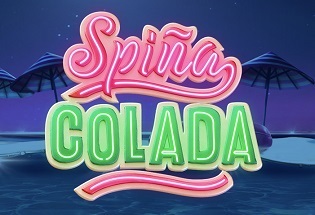 Every Monday there will be a different game where you can play free spins, every Tuesday between 4 pm and 6 pm it is happy hour which means you’ll receive free spins on a variety of games, plus even more on a monthly basis and for VIP members too. Though Sloty don’t accept PayPal, they do accept a number of payment methods including Visa, Mastercard, Maestro, Entropay, Paysafecard, Skrill, Neteller and EcoPayz. There is a minimum withdrawal of £10 and a maximum withdrawal of £2,300 per transaction. The minimum deposit is £10 and the maximum deposit is £5,000 per transaction. Sloty is home to an insane amount of games, – over 1,300, in fact – and as you’d expect the choice is delicious. 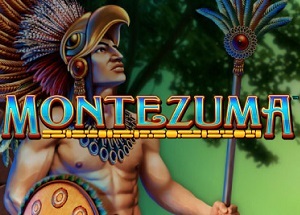 There’s your classic slot games like Starburst, Rainbow Riches and Gonzo’s Quest; there are your progressive slots like the millionaire-making Mega Moolah, Mega Fortune and Hall of Gods; there are even the lesser seen instant-win and scratch card games too. Plus, of course, there’s a host of traditional casino games too plus live dealer on roulette, blackjack, baccarat, poker, double ball roulette, speed baccarat, and dreamcatcher. There’s loads of choice in any category you go into. You’ll never run out of options. Sloty is a proper cool kid. Laid back, stylish, fun to be around, exciting. If Sloty was a person he’d probably be a rapper, the lead singer of a band or that person you were probably slightly envious of at school because they could literally do everything and they looked good too. Because Sloty literally does do everything well – loads of games, an easy payment system, a magnificent bonus offering, excellent navigation, 24/7 customer support, and aesthetically beautiful. There’s nothing that lets this place down. Sure there’s no PayPal, but that’s a minor thing and most online casino’s don’t offer it anyway, but that’s literally the only downside. This new casino has exploded on to the market and it’s looking to dominate.